Remote work isn’t a trend. It’s common sense. Remote work makes sense. If you’ve Googled the term lately, then you’ve seen the articles and the data backing up this statement. As someone who went from spending years sitting behind a desk dreaming of the outside world to living it and being happier and more productive than ever before, the benefits are glaringly obvious if you break it down. In 2007 Occupational Outlook Quarterly reported that only 9 percent of the workforce was working remotely. Fast forward a decade at that number has skyrocketed. Today, nearly 43% of American workers report working remotely part of the time, and that number continues to grow year after year on a global scale. Often described as an employee benefit, remote work is much more mutually beneficial for the employees and the companies who hire them than people realize. And while many still consider it an employee perk, large remote teams are reaping the benefits and aiming to educate other companies about their success building their remote teams. Remote workers often have to deal with logistics and technicalities that would typically be taken care of by administrators or other employees when in an office. These minor distractions can eat away a lot of time, but also teach workers valuable lessons in time management and put out fires quickly. According to a 2017 survey of remote workers by DeskMag, 13% of remote workers consider themselves digital nomads, and 45% of freelancers and remote workers in coworking spaces spend one or more weeks per year traveling abroad. Not all remote workers travel, but the growing popularity of the digital nomad movement offers what many consider to be the ideal balance of work and play through travel. Travelers are willing to test their limits and push themselves to do things outside of their comfort zones. And while working and traveling at the same time may seem like the dream life, it’s not for the faint of heart. Aside from requiring a tremendous amount of self-discipline, it forces you to have the courage to put yourself in unfamiliar settings and locations while trying to maintain a steady and productive work style. Needless to say, this lifestyle can present its own set of challenges not commonly faced by traditional office employees. Remote workers have more confidence and independence which comes from overcoming adversity, having to make on the fly decisions and take action without management peeking over your shoulder. It creates an increased awareness of how to make difficult choices and determine priorities. It’s a growing movement that isn’t slowing down. In a few weeks, CEO’s and founders of entirely remote companies will gather in the Balinese jungle to talk about the future of work. The Running Remote conference will be the first of it’s kind, attracting global leaders who have successfully built and scaled remote teams and want to spread their message and passion for the remote work movement. 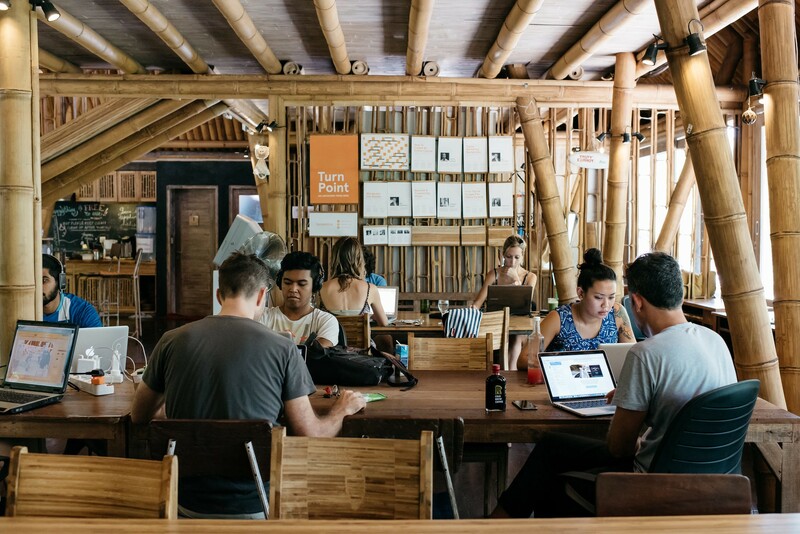 Bali has recently made a name for itself as a digital nomad hotspot, making it the perfect location to host such an event. The event has already attracted global audiences of entrepreneurs who are serious about building and scaling online teams. Leadership from online giants like Buffer, Github, FlexJobs, Todoist are all on board to share their stories and insight on how to grow and manage remote teams on a large scale. This event will likely inspire other similar events in the future as more companies across all industries begin to recognize the enormous value of going remote. Building a remote team comes with its own learning curve, and as more companies jump on board, the prevalence of events to share advice and ideas on communication, building an employee culture and maintaining productivity among remote workers will prove to be exceptionally valuable to teams starting the journey. The internet is littered with statistics about employee retention rates, cost savings, and overall employee satisfaction when working remotely. Overhead and business costs aside, the real value and savings lie in improved employee happiness and retention. Midsize companies around 150 people who experience a 10% turnover rate or higher are spending up to $1.57 million per year on training and onboarding costs for new employees. A survey conducted by employee engagement firm TINYpulse, reveals that 8 out of 10 employees of remote teams are happy with their jobs and feel more valued in their position. Focusing on employee happiness drives growth across all areas. Happy workers will invest more time and energy into the company’s goals and mission and are less likely to spend time looking for a new job or daydreaming about what their life could be if they weren’t trapped behind their desks. Just last year, 82% of telecommuters reported feeling less stress in their lives. This contributed to higher morale among teams and lower rates of absenteeism or “checking out” during work hours. Data from Global Workplace Analytics even reveal that 24% of remote workers can accomplish more in an allotted amount of time than traditional office employees. Without having to deal with the distractions of time-wasting office procedures, impromptu meetings, and procedural minutia, it gives them time to focus on the meaningful work that leads to ultimate productivity and sense of accomplishment. While remote workers have to deal with their own set of distractions that come from working at home, cafes or coworking spaces, there is a level of accountability that encourages them to form their own productivity techniques. In the digital age, and with the number of resources at our disposal, technology has made it easier than ever for teams to connect, collaborate and create amazing things without needing to be in the same room, let alone the same country. Traditional offices are limiting themselves to not only the creativity sparked by flexibility and location independence but are also hindering their access to a global pool of talented workers. At the core, the main resistance companies have when it comes to implementing remote work initiatives comes down to fear of change and the unknown. If you liked this article then you might also like the things I send out in my newsletter. It’s a weekly roundup of valuable content about marketing, business, mindfulness, productivity and maybe a lil’ something else every once in a while. Check it out. If you sign up and you hate it, you can totally unsubscribe, I promise.